Can M-Audio's ambitious pad controller offer something new in the era of hybrid beat workstations? If you're like me, maybe you found yourself feeling a bit dismissive about the launch of a new Trigger Finger. Although the original was hugely successful, you may be forgiven for thinking it's had its day in the age of Maschine and next-generation MPCs. Spoiler alert: it turns out my preconceptions about the Trigger Finger Pro were way off the mark. In one way, the Trigger Finger Pro stays true to its predecessor: it's designed to be a fully programmable MIDI controller that can be used with just about any virtual instrument, DAW or hardware synth. It features 16 pads, four faders and some knobs. The similarities pretty much end there. The Pro is larger, better made, lights up like a Christmas tree, and integrates with its own plug-in host and sound sources. These last make it a true hybrid instrument as well as a controller. But the secret weapon that makes the Trigger Finger Pro a player is its built-in hardware step sequencer. This provides up to 64 lanes by 64 steps, programmed from a row of 16 buttons along the bottom of the unit. You can also record patterns into the step sequencer live from the pads. 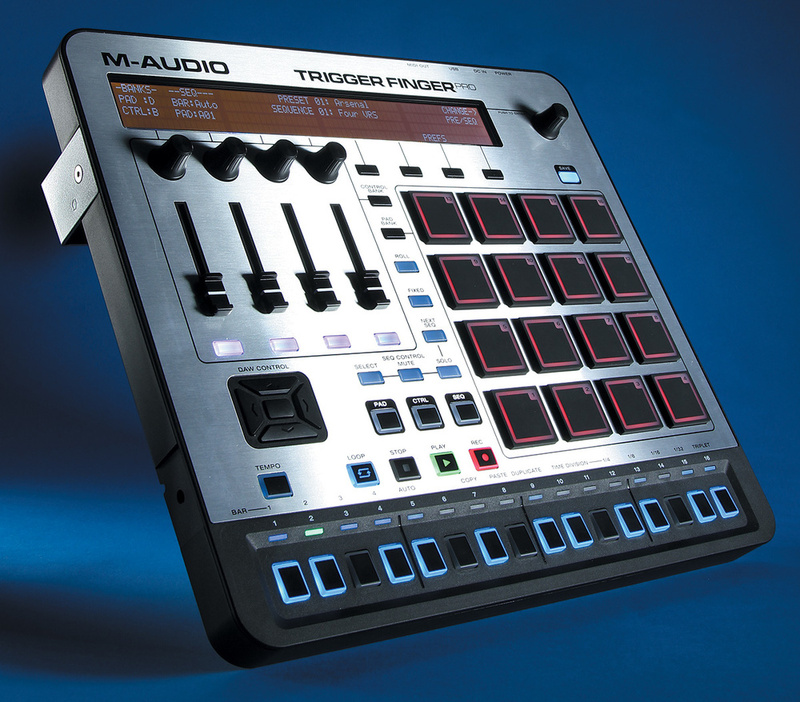 Physically, the Trigger Finger Pro has more in common with modern beat controllers like Maschine or Push than its smaller predecessor, being about 1cm larger than the standard-issue Maschine model. It's slim and flat, rather than the now-standard wedge shape, instead having a metal bar attached to lift it at the back into a comfortable playing position. This bar can be removed (with the hex tool included, Ikea-style) or attached to the front if you prefer, and allows you to hook the unit onto laptop stands or other kit. The obligatory 4x4 pads are made of solid rubber and light up internally in a variety of colours. I found them just as nice to play as the Maschine or MPC pads. Dynamic sensitivity is not bad (especially if you switch the velocity curve to Linear) and the pressure-sensitive aftertouch is really smooth: great for synths or for adding dynamic variation when using the Roll button (better known as Note Repeat on other devices). Other buttons on the surface are of the hard-plastic clicky type of which I'm not a big fan, but which are also seen on competing devices. The control section sports four rows of buttons, faders and rotary encoders, similar to the original. I'm sceptical about faders on MIDI controllers unless they are motorised or touch strips; I'd much rather have another four encoders, as eight is a standard for many plug-ins and Ableton Live rack devices, and encoders offer glitch-free pick-up of existing values. Overall, the build quality is solid, and the Pro feels in a different class of product to the original Trigger Finger. Perhaps there has been some cross-pollination from Akai since M-Audio joined the InMusic group? The Trigger Finger Pro's rear panel features a power button and input for the optional external PSU, a USB socket and a five-pin DIN MIDI Out port. through the banks, or you can hold it and press Pad 1-4 to jump directly to a bank. This arrangement works perfectly for controlling the Live Drum Rack (where I spend most of my musical life, such as it is) whose presets generally populate all of Bank 1 and some of Bank 2. Most other controllers with pads make it fiddly to get at the sounds beyond the first page. Melodic instruments can be played chromatically in the same configuration, or you can dial up preset pad assignments for all of the major and minor scales. Each bank is then divided into two colour-coded sets of eight notes. A bonus effect of this is that anything you record in the internal sequencer can be magically transposed between keys by calling up a different preset. If this helps stop the nails-down-a-chalkboard habit of remixers paying no attention to key, then M-Audio have done the world a service here! As good as this basic functionality is, the TFP package offers a more up-to-date way of working by teaming the hardware up with a plug-in host called Arsenal. Arsenal can run stand-alone or as a plug-in (VST, AU, AAX) in your DAW, and provides a shell for your other instrument plug-ins and an interface that integrates with the hardware. Arsenal does a number of handy things, but it's important to point out that it is not a sequencing or production environment like the Maschine's or the MPC's software. 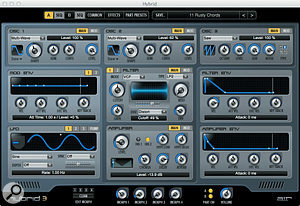 Nor does it offer multiple plug-ins within each instance (although that will likely change). Of course, in your DAW you can run Arsenal on multiple tracks. The closest comparison would be to NI's now-defunct Kore, as it's both a central hub for managing your plug-ins and patches, AIR Drums provides the sampler engine behind Arsenal. and a way of storing and recalling controller assignments with specific plug-ins. Most plug-ins have pre-baked assignments, and you can even store different maps with different patches. This gives instant usable results — ain't nobody got time for manual controller mapping these days. The only down side, as with Maschine until recently, is that you can't directly automate plug-ins in your DAW, just the parameters that are mapped to Arsenal's controls. 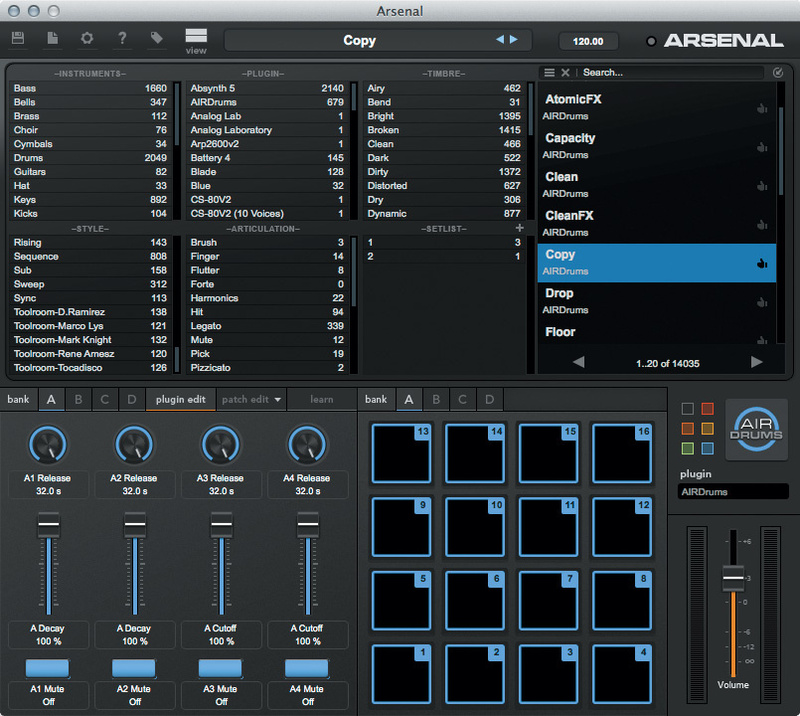 Arsenal scans your VST Plug-ins folder for instruments. Plug-ins that use the standard VST patch system will have all their presets imported, while others will display only a default patch. The library allows tagging of patches, and can be searched and filtered by Instrument, Type, Timbre and so on. Downloads are available for most well-known instrument plug-ins, providing controller maps and patch tags; this makes all the difference and it's an impressive achievement to have this ready at launch. The patch search results pane is a little unfriendly, being presented as pages rather than a scrollable list. However, the list also appears on the TFP screen and can be scrolled through with an encoder. In fact you are able to load two patches from the surface, and switch between them instantly, suggesting Arsenal's engine is sophisticated enough to keep both loaded, even if they are different plug-ins. A feature I really like in Arsenal is that patches can be dragged into and re-ordered into Setlists, and instantly recalled along with their controller mappings. As with the A/B feature, patch loading is smooth and instant even when it's a different plug-in, and note releases from the previous patch are not cut off — very slick. What would be really awesome would be if you could tie sequences to these patch recalls. As it stands, you can save and load sequences to the hardware from Arsenal, but only one at a time, which is no good if you're using several sequencer slots for variations and fills and so on. The TFP's sequencer is its stand-out feature, offering 64 steps Arsenal hosts and manages your VSTis, and recalls your control assignments. per pad (four bars at the default time division setting) across the four banks, with full-range velocity. Steps are triggered from the 16 buttons at the bottom of the unit. You can quickly switch between viewing any of the four available bars in the sequence, or choose Auto mode, where the view follows the play position. In Seq mode, one of the knobs allows you to dial in velocity as you switch on steps. Holding the Select button and pressing a pad shows you that pad's sequence. A 'Night Mode' indicates the beat positions, to aid programming in low light. At any point you can also drop into real-time record and play notes in. The notes will be quantised to the nearest step (16ths in the default mode), but there's a swing control for adding groove. There's a range of ways you can put the sequencer to use. With Arsenal you can run as a stand-alone Hybrid instrument, which is reminiscent of working with classic grooveboxes like the Korg Electribes — a good thing in my book! Thanks to a standard MIDI output port, you can also sequence hardware synths. In fact, if you're an analogue-synth enthusiast, the TFP with a MIDI-to-gate/CV converter would be great. The step sequencer can also be used quite nicely alongside your DAW of choice. There are several preset configurations on the hardware that recall the best settings for different hosts. For example, the Live+Arsenal preset sets your Transport to Mackie Control. With the appropriate settings in Live, the TFP's transport buttons will stop and start Live, and the sequencer will lock to Live's tempo. You can then use the hardware sequencer to trigger Arsenal (or any plug-in) loaded into a track in Live. The sequence can then be captured in real time into a Clip in Live as MIDI, or you could bounce to audio. The Trigger Finger Pro's feature set will likely earn it a place in many live rigs. The unit can be used independently of a computer (with an optional PSU), and of course has the hardware sequencer. It seems built to withstand touring, and everything lights up. There are four banks of knob, button and fader assignments, independent of the pad banks. Every control and pad is completely programmable, and these configurations can be stored as complete Presets. Different pads or banks can be set to different MIDI channels for multiple device control. Controls and pads can send Program Changes and NRPNs, can have commands assigned to the Press and/or release actions, be momentary or toggled, can be on different channels, and you can even choose their colour. If you choose to link the controller to computer sound sources via Arsenal, the Setlist feature has obvious live advantages. A nice side effect of using Arsenal is being able to use VSTis in Pro Tools.When using the internal sequencer for performance (whether live or in the studio) you may find some limitations. Only 16 sequences can be stored in the unit at a time, and you will quickly use up this allocation if you create several patterns and fills for a song. You can save and load sequences to your computer via Arsenal, but only one at a time. A feature where you could load all 16 slots at once, tied to Setlist recalls, would be a great improvement. There's no 'Song' mode for sequencing patterns as with a traditional drum machine but, to be fair, I doubt many people do that outside of a computer these days. Performing with sequences works in much the same way as other similar devices. Mute and Solo modes let you add variation from the pads, while the Next Sequence button switches the pads into a pattern-launching mode. Launch timing choices are End of Sequence, End of Bar, or 'Now!'. Unfortunately this last option restarts the sequence; there's no legato-style mode for instant pattern changes without changing the timing. Weirdly, though, if you recall a sequence from the dial in the main TFP menu, it always picks up immediately at the same beat position. 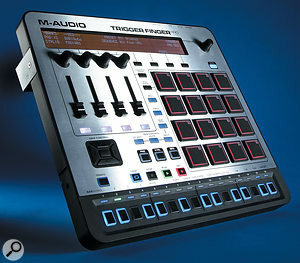 M-Audio have done a great job with the Trigger Finger Pro. They've made some clever choices, in particular with some clear differentiation from the Native Instruments and Akai alternatives. Maschine and MPC obviously offer powerful multitrack hybrid production environments that the TFP lacks. On the other hand, the TFP gets out of the way of your DAW's native editing and arrangement capabilities. The hardware sequencer is unique (and fun!) and backed up by a solid software and sound package. Once the preserve of Pro Tools users, AIR's Hybrid 3 synth is included with the TFP.The impression I got from M-Audio is that they see the Trigger Finger Pro as an important platform to build on. In particular, there are several directions they could take Arsenal. Multi plug-in hosting is apparently coming, both to allow different VSTs on different banks, and to include effects plug-ins. Although M-Audio see Arsenal as a "Production Hub” I sense they are wary not to overcomplicate the clean DAW-focused workflow. Having said that, some extra sequencing and arrangement features could make the TFP an even better groovebox for sketching ideas and live performance. For the time being, though, the Trigger Finger Pro brings real choice to the pad-controller scene at a compelling price, and I suspect it will become as ubiquitous as its predecessor. Competition is fierce in this area of the market, with alternatives from within the InMusic stable, as well as from Native Instruments. A discerning buyer will certainly check out the Akai MPC and NI's Maschine, both of which come in a range of sizes. If you work exclusively in Live, you might also consider Ableton's Push. The MPC Studio and Maschine Mikro both cost the same as the Trigger Finger, but neither offers as many physical controls. However, the MPC and Maschine software components are significantly more capable if you want to work within a dedicated production environment twinned with the hardware. If you prefer to use the generic features of your DAW for composing, then this difference is less of a consideration. The larger and more expensive Maschine and MPC models offer more visual feedback from their displays. But don't forget the TFP's unique weapons: the hardware step sequencer and stand-alone operation, which arguably put it at the top of the list for live use and hardware synth control. Finally, if all you need is a simple pad controller with no bells and whistles, there is Akai's MPD series. M-Audio are very proud of the software and sample package they've put together to complement the Trigger Finger Pro. Let's have a look at what you get. Hybrid was previously a secret gem beloved by many Pro Tools users, available as part of the Pro Tools Instrument Expansion Pack — until version 3, that is. Since AIR Instruments moved from Avid to InMusic (along with M-Audio) their previously RTAS/AAX-only plug-ins have emerged in VST and AU formats. 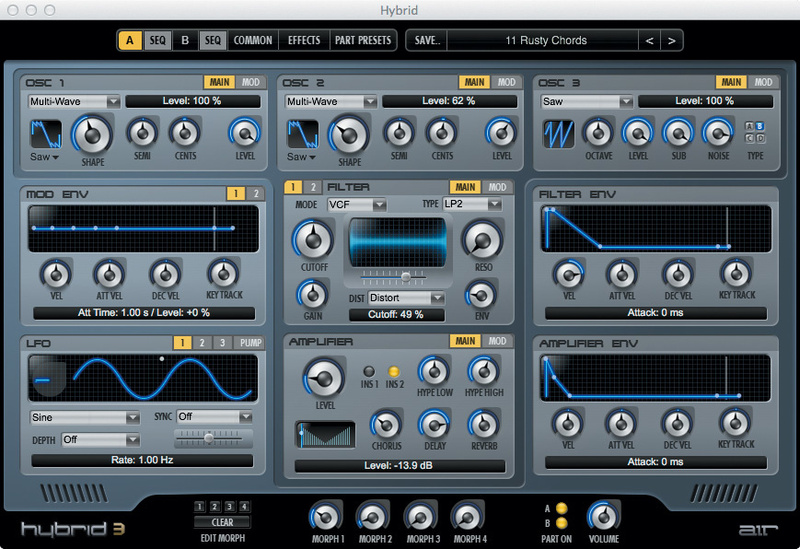 I've always been a big fan of Hybrid: it's an extremely versatile synth capable of both virtual analogue and modern digital synthesis, with traditional waveforms, stacked oscillators and wavetables, dual layers, and snapshot morphing. Version 3 brings improved sonics, 'hype' controls, voice doublers, and improvements to the already ridiculous modulation capabilities. In particular you can now tie notes in the internal step sequencer for more versatile multi-stage mods and melodic rhythms. The presets have seen some serious work, and you get a bunch of exclusive patches as part of the other add-on packs that come with Trigger Finger Pro. 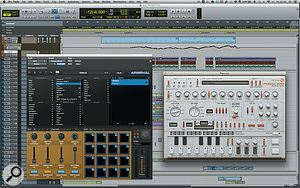 Hybrid is a real 'deal sweetener', and holds its own against Massive, which comes with NI's rival Maschine. 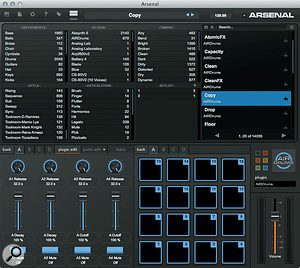 AIR Drums is the percussion-focused sampler that powers the Arsenal drum and loop kit library. It's focused but very capable, with full sample and loop-editing capabilities, intelligent REX loop support and a built-in effects suite. The plug-in can load and save at the full kit, bank, and individual-sample level. Banks of 16 samples can be loaded directly into any of the four pad banks, so that you can have multiple kits available in a single instance of Arsenal. M-Audio are keen to talk up the sample content side of the Trigger Finger Pro package, with a focus on promising out-of-the-box modern dance-music sounds. There is a selection of Prime Loops EDM Essentials packs covering several sub-genres, a pack from sound designer Anomaly, and a tie-in with the the mighty Toolroom Records taking the form of artist packs from the likes of Mark Knight and D.Ramirez. 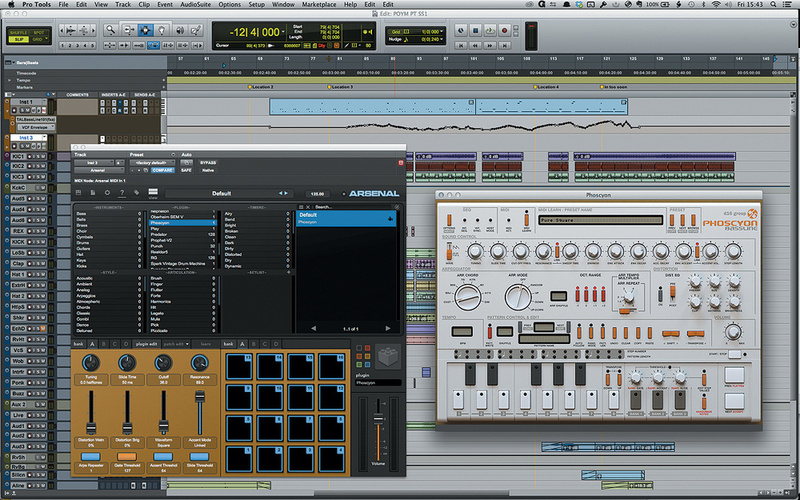 Notably, as well as kits there are good loops, an area that's been a weak spot in the Maschine factory library. Again I had to eat my cynical hack hat, because the kits really are good. They're certainly focused quite tightly towards the house end of things, with little in the way of hip-hop/urban styles that some of the competition tend to favour. But what you get is all super-solid and tight, loud and punchy, and it delivers instant gratification as promised. Highly versatile MIDI pad controller. Arsenal integrates your VSTis with the hardware. No multiple plug-in hosting in Arsenal yet. A great pad controller that takes a different approach from the hybrid beat workstations. M-Audio +1 401 658 5765. MacBook Pro Retina i7 2.7 with 16GB RAM, running Mac OS 10.8.4.